Gone are the days, when women use to depend only on natural home remedies for anti ageing. Now, the market is full of anti ageing products that promise to keep you young forever. Lotus Herbals Youthrx Anti Ageing Transforming Crème SPF 25 is one such revolutionary product recently launched in the cosmetic world with a promise to keep you looking young and beautiful irrespective of your age. I myself found this product while searching for an anti ageing cream and was astonished to see the claims of this amazing product from the well known cosmetic brand, Lotus Herbals. Lotus Herbals Youthrx Anti Ageing Transforming Crème SPF 25 has been developed using the popular Gineplex Youth Compound that is known to be derived from natural ingredients that help in anti ageing. On further research about this product, I found that this is a clinically tested and proven product especially on Indian skin to give not just one but many benefits. Regular use of Lotus Herbals Youthrx Anti Ageing Transforming Crème SPF 25 will not just make your skin firmer, glowing and younger but it will also help reducing the wrinkles, spots, blemishes, tan and all those unwanted fine lines. What more, the results will start appearing within 7 days of regular application of this great Lotus Herbals product. Thanks to the natural ingredients like Ginseng, Milk Peptide and Ginger that make this product so powerful and revolutionary for anti ageing. 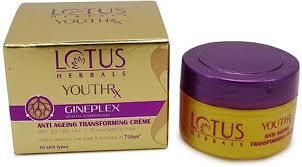 Available in a pretty packing, Lotus Herbals Youthrx Anti Ageing Transforming Crème SPF 25 has a soothing fragrance. This cream gets easily absorbed in the skin without leaving any oily feeling on the skin, so that the user can apply it even in summers. Containing SPF 25, this anti ageing cream easily spreads on the skin and has known to cast no side effects on the user’s skin so far and even women with dry skin can easily apply it for a glowing skin. All you need is to spend INR 120 to buy a mini 10gm pack of Lotus Herbals Youthrx Anti Ageing Transforming Crème SPF 25 and INR 595 to get a 50gm pack of the same product that is easily available on all popular cosmetic shops and online too. Users who have used this product are happy to see its effects and have given it a cool review rating of 4.5 out of 5 and I am definitely one of them.